It's not exactly a shocker, but does still serve to confirm just what interests actually drive American foreign policy - and no it has nothing to do with "sticking up for human rights" or "punishing rogue regimes". President Trump told "Fox News Night" on Wednesday that he wants to know what happened to Khashoggi but expressed reluctance when it comes to blocking arms sales to the kingdom. "I think that would be hurting us," Trump said. "We have jobs, we have a lot of things happening in this country. We have a country that's doing probably better economically than it's ever done before." Ironically this all comes a mere days after on Trump last Sunday said the Saudi king wouldn't last "two weeks" without American support. The statements also come just as a bipartisan group of Congressional leaders are demanding a federal probe into Khashoggi's disappearance and alleged murder that could lead to sanctions on the longtime close US ally. The president continued: "Part of that is what we're doing with our defense systems and everybody's wanting them. And frankly I think that that would be a very, very tough pill to swallow for our country. I mean, you're affecting us and, you know, they're always quick to jump that way." Trump's surprisingly frank assessment came after earlier on Wednesday Republican Sen. Bob Corker, who as chairman of the Senate Foreign Relations Committee cited US intelligence on the case, saying "there was Saudi involvement" and "everything points to them." Corker noted in statements that the killing likely happened the moment Khashoggi walked into the consulate. President Donald Trump says he is "certainly concerned" that missing Saudi Arabian journalist Jamal Khashoggi is dead, but says he hopes he's not. The Washington Post this week revealed US intelligence had clear evidence based on intercepted Saudi communications that Khashoggi was about to be kidnapped and possibly worse just prior to his October 2nd disappearance after walking into the Saudi consulate in Istanbul, only to never emerge again. The WaPo story includes the following: "Before Khashoggi's disappearance, U.S. intelligence intercepted communications of Saudi officials discussing a plan to capture him...". Meanwhile the White House is under increased pressure to respond to growing evidence that the Saudis did in fact murder the journalist. Late in the day Wednesday 22 Senators introduced a letter to Trump urging him to order an investigation under the Magnitsky Act in the matter, which could potentially lead to US sanctions on Saudi Arabia in 120 days. BREAKING: 22 Senators draft/sign letter to #Trump announcing investigation under Magnitsky Act on disappearance of #Saudi journalist #Khashoggi . Could lead to sanctions in 120 days. The bipartisan group formally requested Trump to order an investigation into Khashoggi's disappearance, noting that perpetrators of extrajudicial killings, torture or other gross human rights violations should come under sanction. But apparently for Trump - who took his first international trip as present to Saudi Arabia where he inked a $110 billion weapons deal with Riyadh - such an action against the longtime US ally is not on the table. 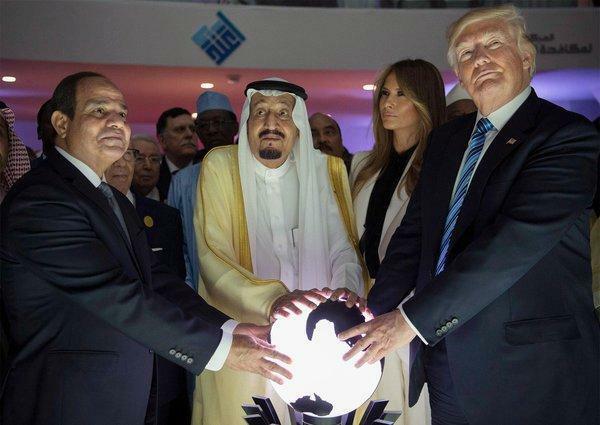 Nor likely would it be for any past administration as the Saudis have long been able to get away with a host of violations, including funding international terrorism (confirmed even in the pages of The New York Times), so long as the "weapons and oil" relationship with the West stays firm.